The Ontario Heritage Trust is calling for applications to the 2019 Doris McCarthy Artist-in-Residence program. The application deadline is September 30. This residency program is open to professional artists from across Canada who are practising a wide array of disciplines. 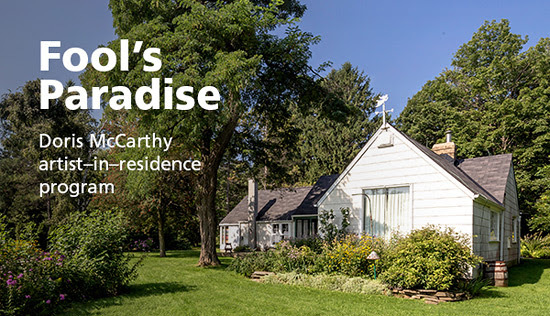 Located at Fool’s Paradise, McCarthy’s former home on the Scarborough Bluffs in Toronto, the site provides accommodation and studio space in a serene and picturesque setting where artists can concentrate on their creative work. Residencies are available throughout 2019, with terms ranging from one to three months. The Doris McCarthy Artist-in-Residence program at Fool’s Paradise is coordinated by the Ontario Heritage Trust. According to McCarthy’s wishes, the Trust established this residency program to embrace the multi-disciplinary nature of the arts, demonstrate the positive and restorative influence of landscape and the environment, and foster excellence among contemporary Canadian artists, musicians and writers. As part of the residency, artists are required to provide a mentorship opportunity to support the development of an emerging artist or artists. The program is supported by the RBC Foundation. Applications must explain why the artist wishes to participate in the program and describe the project to be undertaken during the proposed residency. The proposal must provide a plan for how the applicant proposes to use his/her time. Applicants should also identify and demonstrate the availability of resources and the capacity needed to undertake the proposed project effectively during the residency. Contact Madison Hamilton at 416 314-4907 or email madison.hamilton@heritagetrust.on.ca for more information.